There is so much more inside of us than what we reveal. We are much larger than what we are willing to share and we are greater than what we even dare to imagine. Have you ever imagined what life would be like if... And then we say something like "and then I came back to reality." Who says we can't have what we imagine? Through this book, I am going to help you see more, think bigger and believe God for greater things than you ever have before. According to Ephesians 3:20 Inside of every child of God is the ability to do God things. "Now all glory to God, who is able, through his mighty power at work within us, to accomplish infinitely more than we might ask or think." 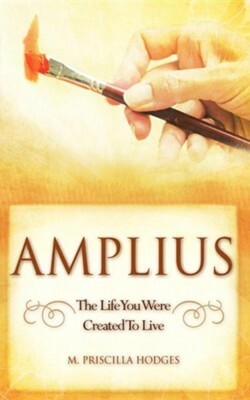 This is Amplius, the beginning of much more Priscilla is a wife and mother of four adult children. She is co-pastor of Eternal Life Worship Center in Norfolk Va. She is a teacher and minister with over 22 years of experience. Her witty yet down to earth style of teaching has been captivating audiences for more than a decade. Although her primary focus is women, she is quite comfortable teaching and preaching along side her husband the Sr. Pastor. Having hosted numerous retreats and conferences the wisdom she imparts has changed the lives of many. She is the author of "The Discipleship Training" and "Ministers Boot Camp" curriculum both of which are used at Eternal Life. She is no stranger to hard work and intense study, which causes the gift of teaching to be a very easy flow for her. Priscilla currently resides with her husband in Virginia Beach, VA. I'm the author/artist and I want to review Amplius.